We welcome visitors and guests to stop by and see us. Congregation Mikveh Israel has docents that will be happy to give a tour to visitors and tell the history of our historic synagogue. While visitors are welcome to stop in during business hours and look at our exhibits and synagogue, we advise visitors who would like to hear one of our docents to call the synagogue office to find out when docents are scheduled as those times can vary. A donation is appreciated. Tour groups of 10 or more people must contact the synagogue office to schedule a tour and for tour rates. For those who would like a virtual tour of our synagogue, see below. A walk through our synagogue will allow visitors to experience over 270 years of American Jewish History. 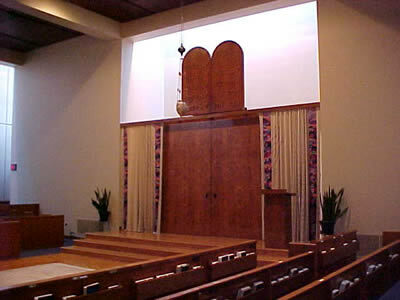 In most synagogues now-a-days, the Torah is read from a table near the Ark. 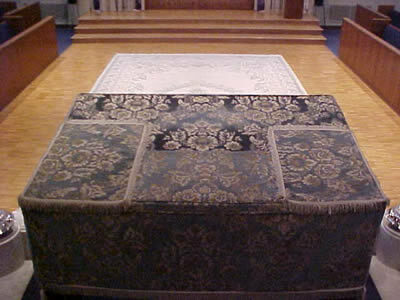 The traditional placement of this table is in the middle or front of the room so that the Torah and the prayers can be clearly heard by all. Here, the Tebah is in the back of the synagogue reflecting the procession portrayed in the tapestry. Its platform and steps were constructed of white Italian/Carrera marble for the 1859 building and dismantled and moved to subsequent buildings. Of simple design, it is made primarily of flat stone planes with decorative edging and railing. Circular capstones depict an etrog (citron) amid its leaves. A removable reader's box stands on a mahogany piece of furniture similar to a desk . The top of the reader's box is an uncommonly large roughhewn oak slab whose size indicates it was probably crafted for one of the earliest places of worship. Comparison of the "desk" with early 19th century furniture indicates that it originated possibly in the first building in 1782. The wooden legs, covered by decorative metal sleeves, are similar to those used in late 18th or early 19th century beds. Click here for schematic drawing of the reader's table. Donated in 1924 by Hannah Morris in memory of her husband, William Morris , parnas/president of Mikveh Israel 1900-1902; 1916-1924. 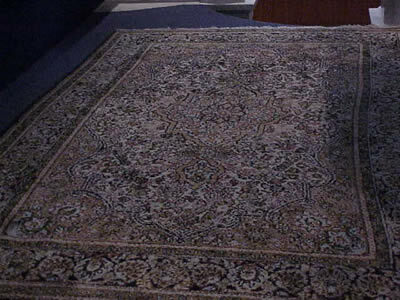 Donated in 2002 by Farah Vessal in memory of her husband Yousef Vessal . The Vessal family immigrated to the United States in the1980's when families from Iran and central Asia increased the membership of Mikveh Israel. The organization and rules that dominated Mikveh Israel from its beginnings set forth requirements for membership. Dr. Moses Lopez, dentist and "bleeder" moved to Philadelphia from Newport , Rhode Island. He was accepted as a member after three years' residency in Pennsylvania, as then required. In gratitude, he presented to the congregation a chair adapted to hold a "Ewer and Basin with Four Damask Napkins for use of the Cohanim." A silver ewer and basin are used in a ritual by the Cohanim to wash their hands prior to the blessing of the congregation on Sabbaths and Festivals. 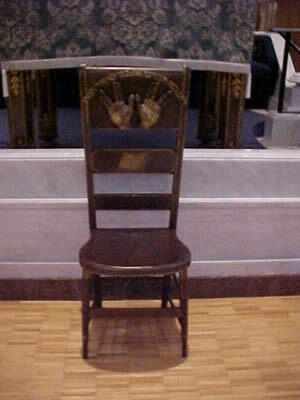 The two hands affixed to the chair illustrate the inscription: "Thus you shall bless the Children of Israel. Say to them:" (Numbers 6:23) introducing the "Priestly Blessing." 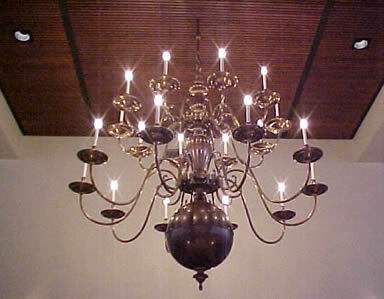 The chandelier, made in the United States, is a copy of those used in the Spanish-Portuguese synagogues in Amsterdam and London. 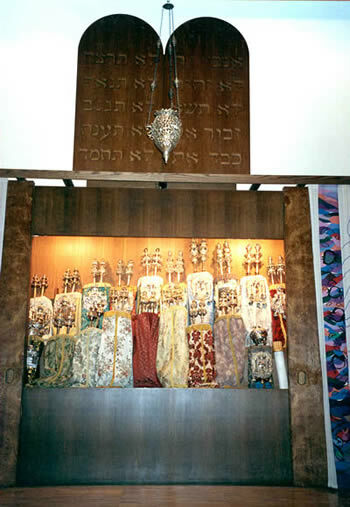 The Hehal contains 20 Sifrei Torah (Scrolls of the Law) adorned with silver breastplates, crowns, and bells. The scrolls are draped with silk mappot . The mantles were traditionally made by the women of the congregation as was the cover for the Readers Desk. The etsei hayim (staves, rollers) are ornamented with silver and gold decorations. Notable are two pairs of rimonim (silver finials) made by Myer Myers, a famous New York silversmith of the time of the Revolution. 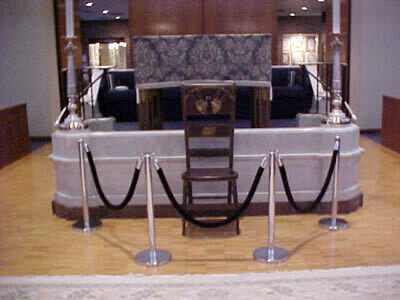 Photograph of the Hehal as it appears when the doors are opened to permit the removal of a Sefer Torah for reading during services. 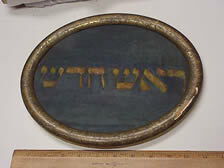 The bottom Ner Tamid was donated by Marie Louise Nathans in 1903 in memory of her husband, Horace A. Nathans, merchant, musician, parnas/ president 1893-1898. 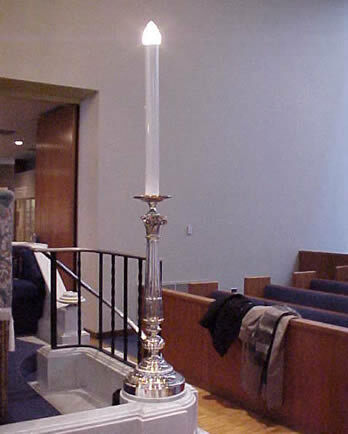 It is lit by a large candle. The Tabernacle in the desert had a perpetual illumination and a perpetual fire on the altar as was the Menorah in the Temple of Jerusalem. The Ner Tamid symbolizes the continuous presence of God and the permanence of the Law. Hung over the doors of the synagogue from the Sabbath preceding the New Moon until the end of Rosh Hodesh. The current plaque is metal with removable copper tags below to indicate the day(s) of the week Rosh Hodesh occurs. A wooden plaque from an earlier period has carved-out Hebrew letters.